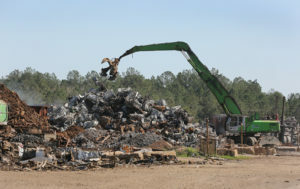 Worn-out cars, childrens’ retired little red wagons and beaten-down bicycles are some of the sources of the scrap metal that turns into steel at the SSAB Americas mill in Axis in north Mobile County. It’s a recycling plant of sorts. And with a planned investment of up to $100 million in the mill and the relocation of corporate headquarters from the Chicago area to the RSA Battle House Tower, Toner says, Mobile County is becoming the flagship of the SSAB Americas division of the Swedish-based steelmaker. Basically, SSAB uses scrap metal rather than the more traditional iron ore to make stronger but lighter steel plates and coils that eventually are used in new automobiles, trucks, ships, cranes, tractors, booms and bridges among other heavy duty items. 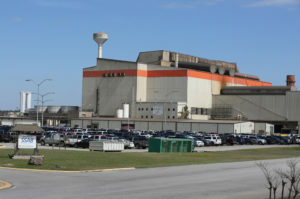 The $100 million investment will go into improved technology rather than a physical expansion of the plant, although administrative offices also are being built near the Axis mill. Scrap metal arrives by rail, makes its way to the mill’s electric arc furnace and emerges ready for a new assignment. “The overall output of the mill does not increase. We will just be able to make more of the higher-value, high-strength steel than we currently can,” Toner says. About 600 people work at the mill. It operates 24/7, shutting down one day each month for maintenance. Sixty corporate jobs are in the process of being moved to Mobile, while up to 50 more may be added as a result of the upgrades in Axis. It’s all a result of what once was considered a gamble by the steel industry, according to Chuck Schmitt, president of SSAB Americas. At the time, older plate mills using older technology were going out of business in Alabama and in the rest of the country. The enormous SSAB mill in Axis, on the Mobile River. 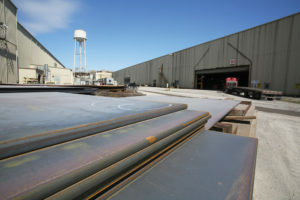 SSAB Americas runs two plate and coil production steel mills, the one in Axis and one in Montpelier, Iowa. There are three cut-to-length facilities in St. Paul, Minnesota; Houston, and Toronto. The corporate headquarters had been in Lisle, Illinois, some 25 miles west-southwest of Chicago. “When I walked around our corporate office in Chicago, I was a bit shocked at the number of people that had not been to our steel facilities, weren’t terribly acquainted with exactly what we do and how we make money in this business,” Schmitt says. SSAB executives considered a completely new location, but Schmitt says an important consideration was being somewhere where they would be more directly engaged with their products. The Axis mill was the more technically advanced of the two, and transportation options were more flexible. Transportation was a crucial factor. Finished products can be trucked out, shipped by rail, barged by river or shipped overseas through the Port of Mobile. While the company shifts its headquarters south, it has offices on the 16th floor of the RSA. The move to permanent digs on the 17th floor is expected to be complete about June 1. 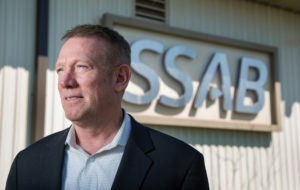 More than half of the corporate employees have agreed to move to Mobile, as SSAB has worked on selling the area to its existing staff and their families. SSAB’s environmentally friendly reputation is a national one. In three of the last four years — 2015, 2017 and 2018 — the company won the American Metal Market Award for Steel Excellence in Environmental Responsibility/Stewardship. So how does scrap metal get recycled into steel? According to Toner, about 200 tons of scrap metal at a time from those junked cars, wagons, bikes and such is put into the mill’s electric arc furnace to be melted into 180 tons of liquid steel. The traditional iron ore blast furnace used in steelmaking creates considerable air pollution, and the entire process is less efficient. The electric arc furnace is much less expensive to operate and more flexible in its operations when orders are slow, Toner says. Liquid steel goes into a caster that resolidifies it into six-inch thick slabs of steel. 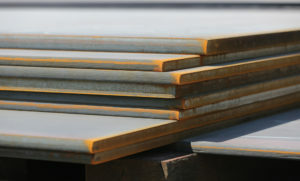 In turn, the slabs go into a rolling mill that rolls it into various thicknesses. The finished product is usually a plate but can also be a coil of steel. The process takes four to five hours. The Axis mill has the ability to quench and temper steel, which creates a stronger product via heating and rapid cooling. The Iowa mill does not have that capability, Toner says. The planned upgrade includes installation of a new accelerated cooling system. All the changes are scheduled to take place between 2019 and 2021, but exactly what will be done and when depends on customer needs and other factors. Toner calls the technology involved “the latest and greatest.” He says the original design of the Axis mill helped position it to move forward now. “Over in Sweden — I was in production operations — they’ve been making these type of products for many, many, many years. So they played an integral part in the design of that facility, because they’ve had years and years of experience that we didn’t have at the time,” Toner says. The proposed improvements will increase the mill’s capacity for high-strength steel production by 130,000 metric tons a year. While an economic incentive package was provided by state and local governments for the headquarters relocation, discussions are ongoing about possible incentives for the potential $100 million investment. The equipment purchases and further advances in technology are factors, in addition to what customers in both the United States and globally want, Schmitt says. Global trade issues may also have an impact. “We’ve come out of a tough period a couple of years ago for all steel companies. There’s been a better economy, a lot of trade talk,” he says. “I won’t necessarily get into the gory details of all of that. But with the improvement in the economy, a better steel demand than we’ve seen in quite some time and with some of the trade actions that have identified companies that have been dumping in the U.S. and North America and not playing by the rules, and some of those restrictions being put in place today, have improved our opportunities. Jane Nicholes and Mike Kittrell are freelance contributors to Business Alabama. She is based in Fairhope and he in Mobile.